Lindsey Holmes, who serves Anchorage district 19 in the House of Representatives, switched parties just after she was elected last year. A group of voters hoping to recall her is getting ready to submit their application to the division of elections. John Miller and his wife, Jo Anne, hold a Recall Lindsey Holmes sign. Photo by Daysha Eaton, KSKA – Anchorage. It’s after 5 o’clock in the Turnagain neighborhood in West Anchorage and Wigi Tozzi is having no trouble collecting recall signatures for the campaign to recall Lindsey Holmes. Holmes, a Republican member of the Alaska House, representing an area that spans South and West Anchorage, was running as a Democrat when voters cast their ballots back in November. Just before the legislature was getting ready to convene in January, she switched parties. That ticks John Miller off. “We voted for her because we favor the Democrat philosophy. She switched to Republican. She got bought off by the Republican Party. I think she’s lost all her credibility,” he said. Miller has already signed the petition. His wife Jo Anne signs tonight. Miller says what really bothers him is Holmes’ dramatic departure from her Democratic campaign issues. “First of all, as soon as she became a Republican, there obviously – there was a deal in the works for some weeks before she switched, probably well before the election. She gets some plumb assignment on a committee and starts voting the republican line on SB21, every pro-business, pro-oil bill. And I spoke to her before the election and she was not in favor of any of that when she spoke to me,” Miller said. 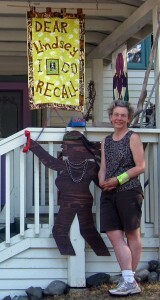 One resident made a quilt and sculpture in support of the Recall Lindsey Holmes effort. Photo by Daysha Eaton, KSKA – Anchorage. 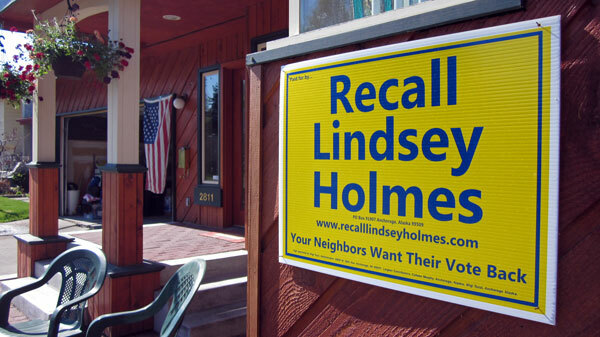 “Welcome to the home of the Recall Lindsey Holmes campaign. It’s my personal home and we started meeting on January 31st,” Colleen Murphy said. Murphy’s kitchen counter tops are covered with stacks of papers. In a corner sit the signatures gathering sheets. “Right there sitting by the window – that’s a lot of people who are concerned about what has happened to the voting process in District 19,” Murphy said. Murphy says Holmes is ‘not fit for duty,’ because she deceived the voters when she filled out her “State of Alaska Declaration of Candidacy” indicating she was running as a Democrat and would serve as a Democrat. Colleen Murphy’s home is the headquarters of the Recall Lindsey Holmes campaign. Photo by Daysha Eaton, KSKA – Anchorage. 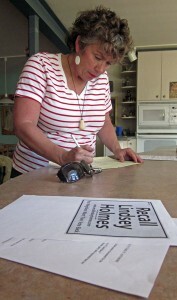 Tozzi and Murphy have big Recall Lindsey Holmes stickers on the backs of their signature collecting clipboards, which they say, makes gathering signatures easy. “It’s their job to prove whether the rationale is …and i don’t think that changing your party qualifies,” Holmes said. Holmes says her decision to change parties was the culmination of a shift she’d been feeling for a few years. “I had felt myself aligning more and more on economic development and business issues with the majority, the Republican-led majority. And I had felt myself distancing myself more from the stances of some of my democratic colleagues. I had just felt that on the economic development and business issues, which I thought were important – if we want to fund schools and roads and police, we need money to do it,” she said. Holmes says she brought in millions for her district as a Republican that she could not have secured had she stayed in the minority. 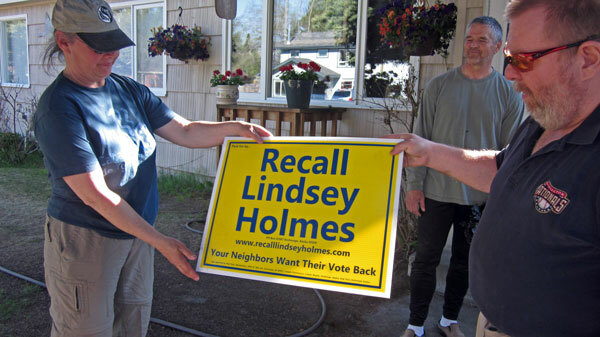 The Recall Lindsey Holmes Campaign plans to submit the first round of signatures required for the recall application to the Division of Elections by the end of June. If their application is approved, they’ll be required to collect 2000 more signatures. If they are successful, the state would hold a special election for voters in her district to decide on the recall.